In all public places in Bass Coast dogs must be on a lead at all times, unless in a designated off-leash area. There are regular patrols to make sure that dogs are registered and on a leash. Under Local Law, a person in charge of any animal on Council land must carry a bag (or other container) to clean up after their animal. They must be able to produce the bag or container upon request of any authorised officer. If within 20 metres of an organised sporting or practice event, a playground area or a permanent barbecue or picnic area, dogs must be on a chain, cord or leash. Strickland Street Reserve, off Korumburra Road to the rear of Butch West Oval. Glen Forbes Recreation Reserve, 200 Almurta Road Glen Forbes. For environmental reasons, no dogs are permitted at any time on the beach from the beach entrance at Anderson Inlet (Caravan Park) 230 metres east of the Inverloch Angling Club, to Screw Creek Inverloch. Dogs are not permitted on the following beaches from 1 December to 30 April each year (inclusive) between 8.00pm to 7.00am and 10.00am to 5.00pm. Phillip Island Nature Parks manages 1805 hectares of flora and fauna reserves including about 60 per cent of beaches on Phillip Island. In most of the reserves and beaches there are no dogs allowed at anytime for the protection of native wildlife and for the amenity of visitors. 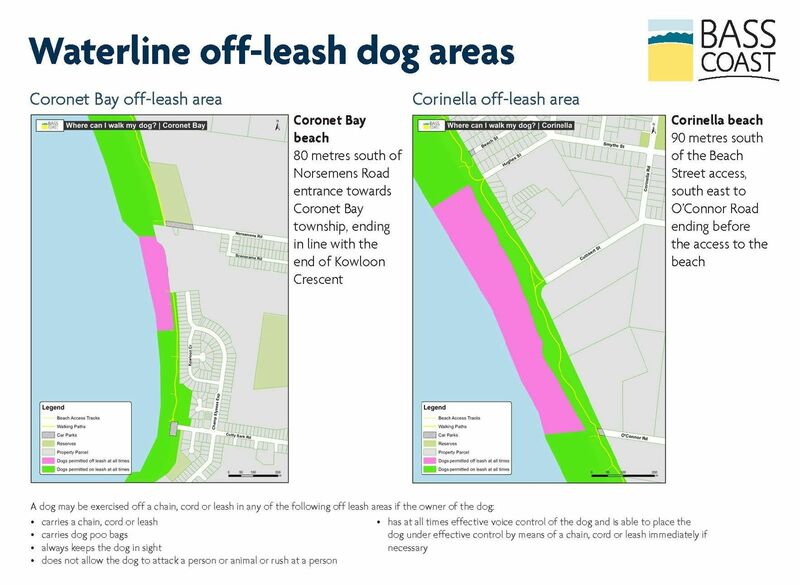 There are however some beaches where dogs are permitted on-leash, for example: Devon Avenue Ventnor, YCW and Smiths Beach, Surf Beach and the Colonnades, with summer restrictions in line with the Council managed beaches. Dogs are not permitted on Council managed Cape Paterson beaches (the Bay Beach, First Surf Beach and Second Surf Beach) from 1 December to 14 April each year, between 9.00am and 6.00pm. Dogs must be on a leash at all other times except when in the designated off-leash area on the First Surf Beach from Whale Rock, around 250 metres east towards the Channel. Dogs are permitted on Council managed Kilcunda beaches at all times if they are on a leash. The beach area below the Kilcunda Foreshore Caravan Park, around 150 metres west towards the rocks, is a designated off-leash area. 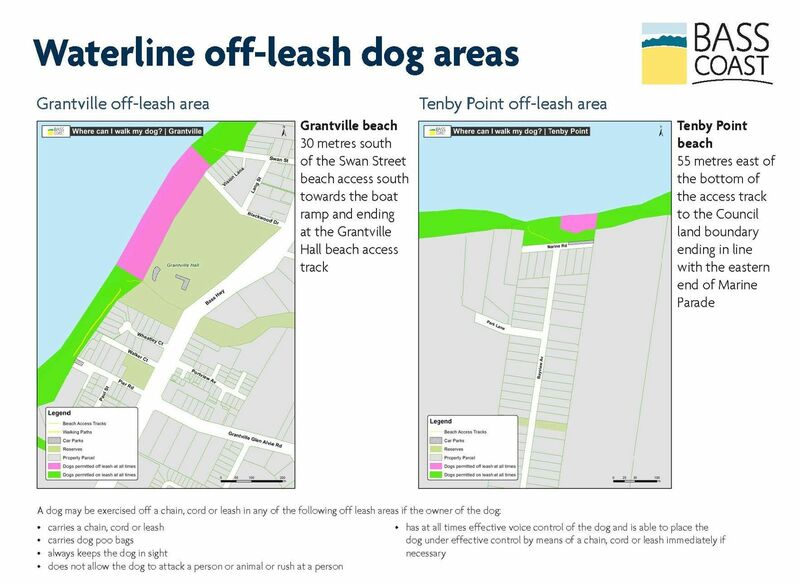 On all other beaches under the management of Council (includes parts of Cape Paterson, Kilcunda, Coronet Bay, Tenby Point and Grantville) dogs are permitted at all times but must be on a lead. Please refer to signage at beach entry points.